His new CD "Big Orange" is available! 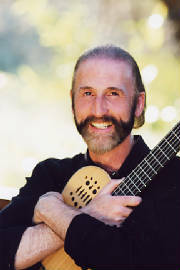 John Wheeler was born in London, England, and studied classical guitar for four years at London's Spanish Guitar Center. After discovering Eric Clapton in the early '60s, he embarked on a long career playing first in original rock and fusion bands and later in commercial groups, both in Europe and the U.S. and Canada. In England, he formed a band that opened shows for artists such as David Bowie and Fleetwood Mac. In Australia, he was a member of one of the country's top recording and concert rock bands. A Reno resident for more than 20 years, Wheeler has played with many of the area's casino acts and is a long-time member of Gary & Sandy's band. He was guitar instructor at the University of Nevada, Reno for seven years and is the author of a comprehensive guitar instruction method. BIography and Photo supplied by artist. (C) Copyright 2002 John Wheeler. All Rights Reserved.